Steven Walsh shoots for Galway as Danny McBride blocks. There was just the one game Sunday at the ICC in Canton. Donegal lined out with two Ballybofey men in the middle of the field, each at either end of their football careers. Donegal stalwart, Michael McGinty, and new arrival, Andrew Bonner manned the middle for the northerners for the 60 minutes. Donegal huffed and puffed in the first half, while Galway did much better than their opponents moving the ball. Galway’s half time lead of two points could have been more had the Brighton men taken their chances, but Donegal lifted their game in the second half to record their second victory of the season. Galway defended well in the first half and did well moving the ball when in possession. The half forwards were very involved in Galway’s attacking moves, and corner forward Kevin Cummins caused numerous problems for the Donegal defence. Cummins put four points over the bar in the first period. Three were from frees, two of which the Roscommon native won himself. The fourth from play was a very well taken score. Donegal looked to play the long ball into David Busteed and Ronan Reilly in the corners, but did not meet with much success in the first half. The Galway back line stuck well to their task and more often than not the ball came in the direction of the Donegal goal. Reilly and Busteed combined for Donegal’s best score of the half, something that Donegal would have hoped to see more of. Collie Carr and Andrew Bonner accounted for the other two points of Donegal’s first half tally, while Danny Reddin was the other Galway scorer. At the half Galway led by a score of 0-5 to 0-3. Peter Ryan tries to break through the Donegal rearguard. Donegal made a change in the forward line to start the second half. David Busteed and Jamie Doherty switched places. Galway almost extended their lead soon after the restart however. Cummins beat his defender and passed across the face of goal to Gearoid O’Connor. O’Connor’s shot from close range was blocked for a 45 by Emmet Doonan on the line. That was as good as it got for Galway for most of the second period. With the half twelve minutes old Donegal claimed the lead. Andrew Bonner played a big part in the Donegal effort. Donegal recorded the first score of the half. Following a Bonner run, Jamie Doherty put a fine point over the bar from a tight angle. Ronan Reilly followed with a pointed free and the sides were level. Donegal’s go ahead point came from David Busteed chasing back and winning the ball, for Doherty to finish with another great score. Bonner added another point with a bursting run through the Galway defence, Danny McBride extended the lead to three soon after. It was Galway coughing up the ball now as the Donegal defence tightened, and several attacks came to naught. Cummins had to come deeper than he would have liked to see the ball and rarely had a chance to shoot. Galway did get within a point in the late stages of the game and had Donegal hanging on to their slender lead for the last 5 minutes. Peter Nolan recorded a score off his left boot and Gearoid O’Connor brought Galway within one two minutes later. It was a tense last 5 minutes as Donegal hung on. O’Connor could have salvaged a point for Galway. O’Connor dummied his man and having brilliantly made the opening, fluffed his shot and dragged it wide. Two out of two for Donegal,and Galway still looking for their first win of the season. Donegal: L. Mailey, H. Devine, M. Canney, P. McLoughlin, E. Doonan, D. McBride, M. McGinty, A. Bonner, J. Doherty, K. Curran, C. Carr, R. Reilly, D. Busteed. Galway: D. Faragher, S. Gallagher, P. Cummins, E. Costello, G. Dunphy, J. Kehoe, E. Kavanagh, P. Ryan, G. O’Connor, P. Nolan, D. Reddin, S. Walsh, K. Cummins. Denis O'Brien called and I got him up to date with the goings on in the Boston North East Board. Rather than seeing the end of the world as was predicted, Saturday May 21 was a historic date in the annals of the Boston North East GAA. The first Junior C Hurling match took place in Concord, New Hampshire. It was a great occasion with great volunteerism from people stepping in to help with officiating and taking pictures. The game was played in a sporting manner. Concord dominated the first half and at the break led by a score of 2-4 to no score for the visitors. The second period saw Portland come storming back to get within a few scores of their opponents, but a late goal from Concord sealed the victory. Mike Moynihan refereed the game, and a lot of credit goes to Ray Valas and Alan McGrath, amongst others, in the birth and growth of newest hurling clubs in the region. A reception was held at the Barley House Wolf Tavern across from the Capitol building in Concord. Both clubs, along with the Worcester Hurling Club, have plans to travel to San Francisco to compete in the NACB Finals on Labor Day weekend. Barley House Wolves: Denny Trainor, Ryan Brown, Sean McCarthy, Matt Polamina, Rory O’Mahoney, Eddy Clements, Dan Hanna, Mikhael Gregoire, Darragh Madden, Lore Ford, Ray Valas, Derek Reese, Will Mullen. Portland: JJ Twohig, Lance Myrich, Larry Maher, Chris Fleming, Tim Schinder, Chad Nelson, Terence Leahy, Aidan O’Brien, Charles Schilinder, Joe Flaherty, Damien Bolger, Mark Rollins, Joel Wizowic. 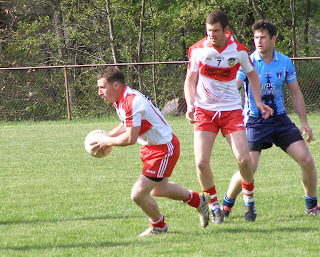 In a game that saw three red cards and five goals the Connemara Gaels came away with the points. There was tremendous excitement as the game ebbed and flowed. Twice the Gaels looked like pulling away but the Blues reined them back in and it all boiled down to the final kick of the game, a free that drifted just wide to the relief of the Gaels and disappointment of the Blues. Barry Murphy carries the ball out of defence. The Blues held the edge over the Gaels for most of the first half. Whether running the ball from midfield or making the long pass into the corner the Blues had the Gaels back line in a little bit of disarray. Kieran Hurley capitalized for the Blues with some accurate free-taking. With the teams level on two points each, the Blues established a three point lead. The Gaels seemed stuck in the blocks and were unable to get a foothold in the middle of the field. The Blues were first to the breaking ball and enjoyed the lions share of posession. The Gaels kept working to make something happen, and eventually got a reward for their efforts with a goal from Stephen Monaghan that leveled the scores. Brian O’Connor beat his man on the edge of the box and passed to the incoming Monaghan who side-footed home from close range. Following the goal the Blues lost Kevin O’Shea to a red card for striking an opponent in full view of the referee. Having drawn back to level terms, the Gaels now had the bit between the teeth. Further points came from Robbie Fox and O’Connor, and a second goal just before half time from O’Connor seemed to put the Gaels in the drivers seat, but not for long. The Gaels lost O’Connor shortly after the goal for a second yellow card, and now the sides were level in personnel. At the half, the Gaels led by four points, 2-4 to 0-6. 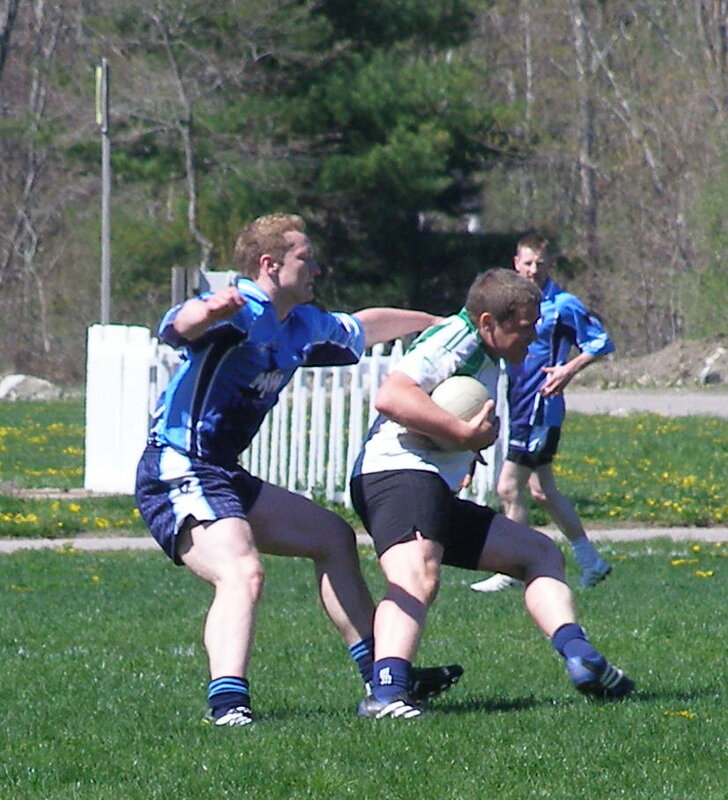 No holds barred when the Gaels and Blues met on Sunday. The Blues stormed right back into the game after the restart and were on level terms within 2 minutes. Hurley, who was having a fantastic game in the corner, won the ball from behind his marker and after turning blasted home from close range. The corner forward followed with a fine point from a free and the sides were level. The Gaels introduced Tommy Walsh, and the former Galway minor made an immediate impact with a point to put the Gaels back in the lead. A goal came soon afterwards from Stephen Monaghan. A great ball from Walsh found the incoming Monaghan who chipped the keeper from an angle and the Gaels were back in front. Now it was the turn of the Blues to take over, and rattled off five points in a row. Shane Cahill seemed a magnet for the ball and the man from Mitchelstown won ball after ball for the Blues. Four Hurley points ensued, one was a real beaut under pressure on the sideline. Denis McElligott tallied the fifth and with the sides level and the game in the balance the Gaels looked like they would finish the stronger side. Barry Murphy dispossessed his marker as the Blues looked to launch another attack, and the Gaels swept down the field for substitute Niall Judge to handpass over the bar. Cathal O’Neill added another before another sending off, this time the Shannon Blues Sean Moriarty. Things seemed to be in hand for the Gaels, Tom McDonagh and Niall Judge extended the lead to five points. The Blues weren’t done however. Denis McElligott, who put in a tremendous 60 minutes for the Blues, poached a goal as the Gaels back line lost concentration, and Cathal O’Neill added a point. With just a point in it, the Blues had a chance to salvage a point from the game but Hurley’s free from 45 yards went just wide of the posts. A hard won two points from the Gaels, for the Blues a fine performance that just fell short. If this game is anything to go by, the outlook looks exciting for the rest of the season. Gaels: B. Joyce, L. Wylie, W. Callaghan, B. Murphy, P. Hogan, S. Manley, B. O’Connor, T. McDonagh, R. Fox, C. O’Neill, B. Carroll, S. Connolly, S. Monaghan. Blues: G. Kissane, S. Sinnott, C. Mullen, D. McElligott, P. Magee, D. White, P. Murray, K. O’Shea, K. O’Sullivan, S. Cahill, M. Lyons, S. Moriarty, K. Murray. Three goals separated the sides in this Sheehan Cup encounter between Brighton rivals Galway and Wexford. The game got a little chippy in the second half and a melee broke out late in the game. Wexford were full value for their win and looked comfortably in charge for most of the second half. Eoin Kavanagh and Gearoid O’Connor put in excellent performances in the forward line for Wexford as the model county maintained their hundred percent record this season. Wexford's Eoin Kavanagh is watched by Killian Murphy. Wexford went in at the break five points to the good. Two first half goals made the difference between them and their opponents. Ten minutes into the game it was all square with each side sitting on two points. With Wexford getting the better of the exchanges in the middle of the field the model county got some separation between themselves and their opponents in the second quarter. Shane Murphy netted first for Wexford mid-way through the half. After the Dubliner added a point to Wexford’s lead, corner forward, Eoin Kavanagh, netted a second from close range. Galway found themselves a man down as the half reached its conclusion. John Moylan was given his marching orders for what can only be described as dissent. Brown and Kavanagh exchanged points before the break and Wexford sat on a five point lead going into the second period. Galway started off well in the second period and made some inroads into the Wexford lead. Killian Murphy pointed two frees from long range to put a solitary goal in it. Wexford, however, pressed home their advantage in play with three points from Shane Murphy and Gearoid O’Connor between them. Wexford had several more chances to score as play flowed mostly in one direction, and had they chosen points rather than trying to go for goals there could have been more in it. After Seamus McComiskey pointed for Galway, a third goal came for Wexford from Eoin Kavanagh with 15 minutes left. Tempers took over as a melee broke out that eventually calmed down. Wexford still unbeaten in the Sheehan Cup, and Galway still looking for a their first win. Next week the westerners will meet old rivals Fr. Tom Burke’s. Galway: K.Finnegan, R. O’Leary, J. Kinsella, K. Murphy, M. Brooks, G. Sherlock, P. O’Connell, D. McMahon, S. McComiskey, S. Brown, L. Byrne, P. Byrne, J. Moylan. Wexford: E. Sproune, G. Griffey, D. Redmond, B. Dalton, D. Magill, JJ Kenny, J. Foley, J. Kehoe, G. O’Connor, P. Ryan, S. Murphy, C. Kearns, E. Kavanagh. Tipperary and Fr. Tom’s served up a fantastic Sheehan Cup hurling contest. Tom’s worked hard for the entirety of the game, and in spite of almost letting it slip on a couple of occasions, kept their focus to earn the win. Trevor Kelly led the effort from the middle of the field, while Shane Howley in the forward line put in a man of the match performance with his accurate shooting and a critical score from play in the late stages of the game. Tipp Captain Cronan Dempsey gets under the puckout. Fr. Tom’s had the better of things for most of the first half and came out of the gates strong, clearly eager for a result. Shane Howley was the star in the forward line picking off scores from play and from frees. Tom’s went into a two-point lead in the early going thanks to Howley’s sharp shooting. 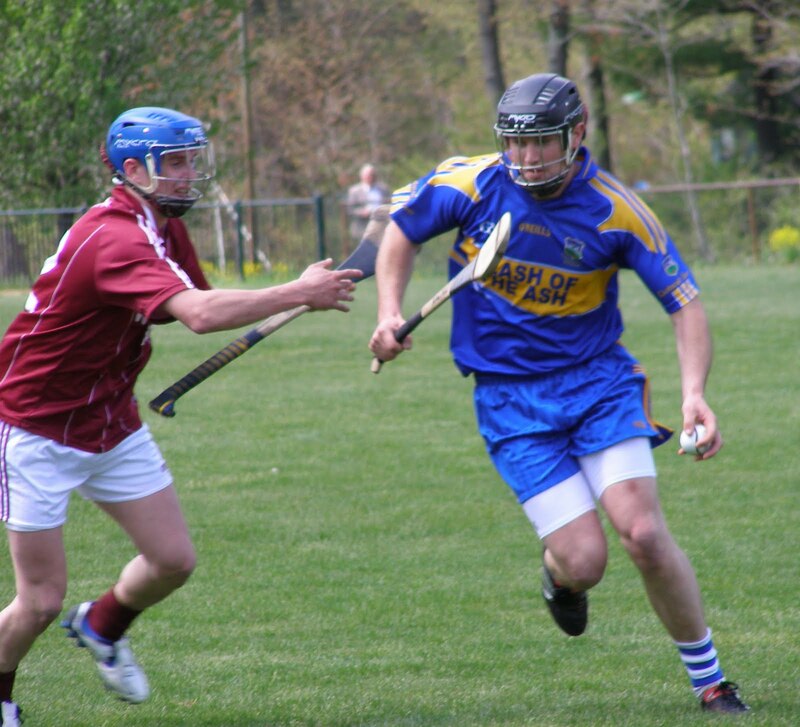 After Andy McRedmond got Tipp on the board with a point, a goal came from the Blue and Gold. Cronan Dempsey won the ball in the middle of the field and his long ball might have been tipped by corner forward, Ian McMahon, before crossing the goal line. Tom’s kept up the tempo however and refused to let the setback upset them. Some solid performances in the back line from Donal Moore, John Dowling, and Dermot Nealon held the Tipp forwards in check. Howley and Fran Keenan capitalized with points to draw Tom’s level before Howley put his side ahead with a superb score from play. Tom’s won a penalty shortly afterwards, Paul Henehan was fouled while in possession, and penalty speacialist, Fran Keenan, drilled the ball into the back of the net. Tipp finished the half with points from Darragh Kealey and a long range free from John Roache to keep their side in touch. Tom’s 1-5 to 1-3 for Tipp at the break. The second half was a tense exciting affair. Tom’s clearly saw the chance for the win was there for the taking. Keenan opened the scoring with a free to extend Tom’s lead. Paul McGrath, who put in a lot of work for Tipp, answered with a fine score. 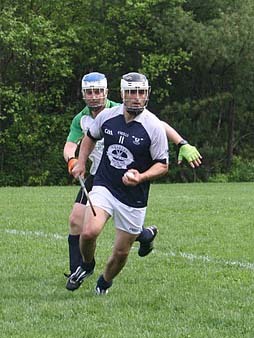 Trevor Kelly, playing a commanding role in the middle of the field, extended Tom’s lead with two fine points from play. Tipp however picked up the pace. Paul McGrath and John Roache pointed three times between them to a single point from Howley for Tom’s and with just a goal in it the spoils were still there for whichever side wanted it more. Tom’s were again bitten by a high ball into the box that ended up in the back of the net, and with four minutes left it was all square. Tom’s dug deep. Shane Howley restored the lead with a hard earned point, a critical score at that stage, and Ciaran Moore put the finishing touches to the win the final score of the game. 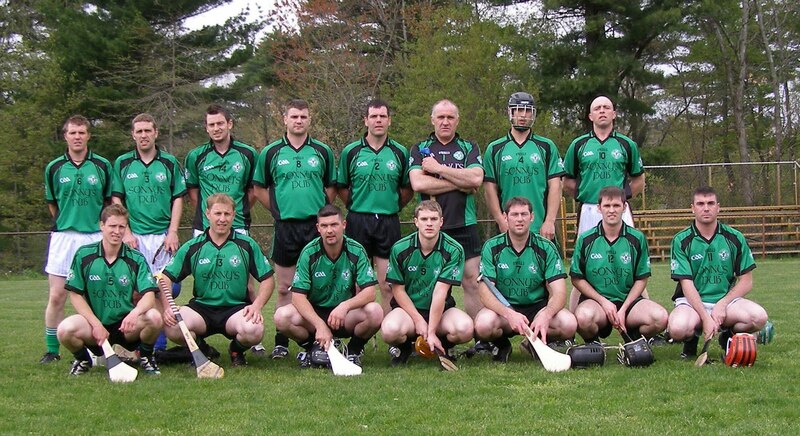 A great game of hurling, especially at this early stage of the season. Tipp: M. McGrath, J. Kindregan, J. Roache, J. McGrath, J. Duane, A. McRedmond, C. Dempsey, P. McGrath, N. O’Grady, D. Kealey, M. Daly, I. McMahon, S. Sinnott. Tom’s: D. Hession, S. O’Brien, D. Nealon, E. Cummins, D. Moore, J. Dowling, J. Dooley, F. Keenan, T. Kelly, S. Howley, S. Higgins, P. Heneghan, K. Mooney, C. Moore. Wolfe Tones and Armagh-Notre Dame met in the second senior football championship match of the day on Sunday. It turned out to be a one sided affair. Once the game was fifteen minutes old the Tones took control and never looked in danger. Armagh-Notre Dame kept pace with the Tones in the early going. James Doyle was excellent at corner forward for the Tones, his goal 20 minutes into the first half was the score that put enough daylight between the teams to allow the Tones to settle and pull away from their opponents. Loughlinisland native Seamus O'Hare battled hard for Armagh-Notre Dame. ﻿ The opening quarter was evenly contested. Seamie O’Hare opened the scoring with a pointed free, and Kenny Regan answered for the Tones. Corner forward James Doyle, who caused havoc in the Armagh-ND rearguard for the 60 minutes, then put the Tones ahead. Before the half was over Doyle would have another goal and another two points to his credit. The Brighton side worked hard throughout the half even though the game was slipping slowly but surely from them, and before Doyle’s 20th minute goal, were very much in the game. As time wore on one felt the Tones were getting a firmer hold on the game. Kenny Regan at center back, Eoin Naughton in midfield, and Alan Higgins at wing forward began to put their stamp on the game. With the half winding down, Marty Farrell could have had a goal. The Down man rode some tackles beautifully and with the goal at his mercy blazed over. James Doyle put the last two points of the half over the bar. At the break the Tones led by a score of 1-8 to 0-4. Kenny Regan was in control for the Wolfe Tones. The Tones extended their lead right after the restart with two points in the first few minutes, not an ideal start from the Armagh-ND viewpoint. Farrell added a third and with the Tones leading by ten points, an Armagh-Notre Dame comeback appeared an unlikely prospect. The Tones tagged on some more scores but with the game beyond them, Armagh-ND continued to battle on gamely. John Comiskey, Seamie O’Hare and Shane McKenna did well for the northerners, while for the Tones there were good performances from Kenny Regan, Mike O’Brien, and Alan Higgins, and a man of the match performance from James Doyle. Armagh-ND: D. Fields, M. McAuley, G. Kearns, S. McKenna, F. Meehan, T. Cassidy, D. Magill, J. Comiskey, G. Hall, N. Finnegan, M. Tiffany, P. McEvoy, S. O’Hare. Tones: C. Hynes, D. Maguire, A. Rooney, M. O’Brien, K. Regan, C. Malone, C. Power, E. Naughton, A. Higgins, M. Farrell, B. Blanchfield, J. Doyle, S. O’Brien. Galway pushed Aidan McAnespies right to the finish line in the opening senior football championship outing for each club. The Pat O’Brien Cup winners came through in the end in large part thanks to the performance of Paul O’Donoghue at corner forward. The man who came from the St. Mary’s club in Kerry got the critical scores in final stages of the game to ensure the first points of the season. Galway's Eoghan Costello and Plunkett Kane of McAnespies. By the time the first 30 minutes were over McAnespies held a four-point lead. The scorers were well spread throughout the forward line. O’Donoghue was the main provider with three points, while fellow St. Mary’s man, Sean Cournane accounted for another as did Stephen Magill. Midfielders Plunkett Kane and Philip Toner also got on the scoresheet. Galway corner forward Kevin Cummins caused lots of problems for the McAnespies back line. So much so that the McAnespies management switched Niall Kerr from center back to mark the Roscommon native who had got Galway on the scoreboard. Galway almost made their opponents pay for several missed chances in the second half. For the first 20 minutes McAnespies failed to score and Galway inched closer. Having scored the first three points of the half, the third coming from Gearoid O’Connor, a surprise result was on the cards. McAnespies, however, made sure that would not happen. O’Donoghue netted and added two more points to put the game out of Galway’s reach. McAnespies on the board with two championship points, and for Galway, we could be hearing more from them as the season moves on. Galway: JJ O’Neill, G. Dunphy, S. Gallagher, E. Costello, P. Cummins, J. Kehoe, E. Kavanagh, P. Ryan, G. O’Connor, P. Nolan, D. Reddin, D. Redmond, K. Cummins. Macs: C. Kendrick, M. Bogue, A. McAnespie, S. Hughes, N. Kerr, N. Gallen, P. Toner, P. Kane, M. Little, C. McCrory, S. Magill, P. O’Donoghue, S. Cournane. 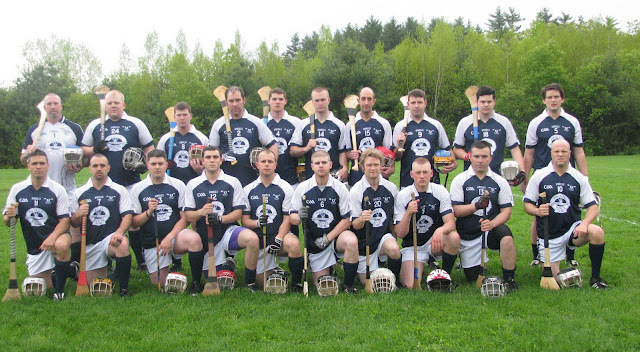 There was a weekend full of action in Canton, and also Concord New Hampshire where the first Junior C Hurling match in the history of the board was played. Portland traveled from Maine to Concord NH to play the already storied Barley House Wolves. The Wolves won the game 5-7 to 2-5, and had to withstand a second half comeback effort from the visitors. In Canton the game of the day was between Shannon Blues and Connemara Gaels. The Gaels pulled out a one point victory in an epic battle that sent the punters home content. In other action, Wolfe Tones easily beat Armagh-Notre Dame, and Mayo had a six point win over Cork. On Saturday there were 2 make up games. Aidan McAnespies beat Galway by a score of 1-9 to 0-7, and Donegal had an easy win over Christopher's. Sheehan Cup hurling action on Sunday saw Tom's beat a Tipp and Wexford continue their winning form with a win over Galway. Munster rivals Kerry and Cork kicked off the Senior Football Championship amid very wet and difficult conditions Sunday afternoon. With 29 minutes gone in the second half Cork held a three-point lead and it looked as if The Rebels had the points in the bag. Kerry persisted however, and as Cork struggled to clear their lines a late goal from Kerry corner forward Damien Kelly proved to be the wining score in a dramatic finish. 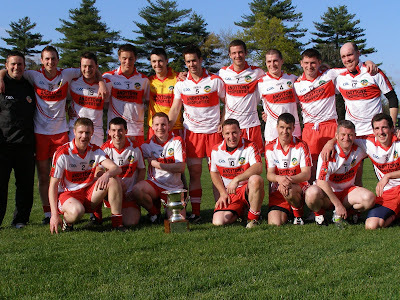 2011 Senior Football Championship opener. Conditions made it difficult for both sides to hit their men in the forward line. Colm Caffrey marshaled the back line well for Cork and Kerry’s early efforts at moving the ball frequently broke down. Caffrey's counterpart, Kerry center back Tom Dennehy, did a lot of mopping up. Eventually Mike Moynihan opened the account for Cork with a well-taken point from play and after eight minutes added another from a free. With Cork looking like they were taking control Kerry struck with a goal from nothing. A free kick from 50 yards was dropped into the square and Padraig Doyle got a hand to it to direct the ball into the Cork net. Kerry followed with a point from Ian Whelan and the Kingdom now held a two-point lead. Cork weren’t long about canceling out the goal. Mike Moynihan finished a move that began with Julian Leonard at corner back, Cork moved the ball well downfield and Stephen Birmingham passed to Moynihan who made no mistake from in front of goal. Cork almost had a second when Trevor Kelly was found on the edge of the small square, but Kerry keeper, Dan O’Connor, narrowed the angle and Kelly’s shot trickled wide of the far post. The sides traded points before the end of the half, David Hughes for Cork and Damien Kelly for Kerry. At the break Cork led by a score of 1-3 to 1-2. Julian Leonard tries to get the block in on Ian Whelan. The rain eased off the second half, however, conditions remained difficult. Stringing together a few passes was a challenge, and after Kelly leveled the scores with a free for Kerry five minutes into the half a long scoreless period ensued. Both sets of backs were in the ascendancy with play moving up and down the field. With the game in the balance Cork were the side that broke the deadlock with three points in quick succession from Mike Moynihan. With 10 minutes left on the clock Cork looked a good bet to come away with the win. Kerry went in search of goal as the minutes ticked away, while for Cork it was all hands on deck to clear the lines. Cork, however, paid the price for failing to do so effectively and went from 3 points up to 3 points down in a six-point injury time swing. After Cork beat back a 14-yard free that was hit low, Sean Fogerty settled for a point from the rebound. 30 minutes gone and Cork up by two, but stoppages for injuries earlier in the half meant time was left on the clock. Cork continued to turn the ball over when trying to come out of defence and eventually it proved costly. A quick move led to the ball in Damien Kelly’s hands and the corner forward blasted home to the delight of Kerry supporters. Cork tried to lift their game to salvage something, but Padraig Doyle and Kelly added a point each for Kerry before time was up. Cork, who looked like winning some early championship points, will find this one hard to swallow and the rebels will hope to put it behind them when they meet Mayo next week. Kerry’s persistence paid off in the end, and they will need more that attitude as the championship progresses. Cork: J. O’Toole, J. Leonard, J. Regan, C. Poirer, C. Caffrey, D. Hughes (0-1), S. Caulfield, M. O’Leary, M. Cahilane, T. Kelly, S. Bermingham, M. Moynihan (1-5), A. Boyle. Kerry: D. O’Cruchuir, M. Godley, C. Moore, M. Moriarty, T. Dennehy, T. Fitzgerald, S. Fogerty (0-1), C. O’Sullivan, E. Cummins, P. Bailey, P. Doyle (1-1), I. Whelan, D. Kelly (1-4). There was one fixture played today at the ICC in Canton. The senior football championship match between Cork and Kerry resulted in a Kerry victory by a score of 2-6 to 1-6. (Match report to follow shortly). The Sheehan Cup fixture between Fr. Tom's and Tipp has been rescheduled for Wednesday May 25 at 5:30. The senior football championship fixtures have been rescheduled for next Saturday, May 21. Galway and McAnespies will meet at 3:30 while Christopher's and Donegal will play at 4:45. (Dates and times were revised from original post). Galway and Tipperary contested the opening game of the day. It was a complete turnaround from last week for Tipp who registered 21 points. Tipp no doubt were eager to make up for last week’s sub-par showing against Wexford, while for Galway it was their first outing of the year. The first half was mostly an evenly contested affair, however, Tipp came to grips with the game and ran away with it in the second half. Cronan Dempsey put in a captains performance in the middle of the field, while at the back John Roache and Brian Howley played well. Tipp's John Kindregan and Galway's John Moylan. There was not much between the teams in the first half. Stephen Brown opened the scoring for Galway with a well taken point. Tipp answered with three, one each from Andy McRedmond, Paul McGrath, and a John Roache free taken from well inside his own half of the field. In between John Moylan almost had the ball in the back of the net for Galway, however, Darragh Kealy got down well to make the save. Galway had trouble finding the men in the full forward line and many’s a ball dropped in was easy picking for Kealy in the Tipp goal. The Galway back line did well clearing their lines, center back Killian Murphy was busy for much of the half. Tipp stretched their lead as the half wore on and the pressure began to tell, yet fortunately for Galway not by as much as they could have. Tipp missed several good scoring chances. McRedmond pointed again and Roache fired over a ’70. Galway answered with points from Brown and Moylan, but Tipp had control over affairs. Towards the end of the half Tipp put four unanswered points over the bar, Brian Howley, McGrath, and Colm McCrory hitting the mark. At the half Tipp led by a score of 0-9 to 0-5. Tipp killed the game off early in the second half. Playing with the breeze, it was a procession of scores from the men in blue and gold. Tipp opened up a 12 point lead before Galway could register a score. Every Tipp forward got on the scoreboard, however the pick of the scores in the second half came from Cronan Dempsey in midfield and John Roache from corner back. Galway tried to shuffle the forward line around, however could get nothing going save for a late consolation goal from Stephen Brown. A great turnaround performance from Tipp after last week’s flop, and Galway looking for some improvement next week. Galway: C. Fahy, J. Kinsella, G. Sherlock, M. Brooks, K. Murphy, K. Finnegan, D. McMahon, A. Callnan, S. McComiskey, S. Brown, L. Byrne, N. Galvin, J. Moylan. Tipp: D. Kealey, J. Kindregan, J. Roache, A. McAnespie, B. Howley, J. Duane, C. Dempsey, M. Jordan, A. McRedmond, P. McGrath, C. McCrory, J. McGrath, S. Sinnott. Tom’s and Wexford met in the second game of the day, the winner would go top of the table for the Sheehan Cup. Wexford followed last week’s impressive display with another victory with room to spare. Tom’s took a while to get into the game, but laid down the gauntlet to Wexford early in the second half, however, the Brighton based side weathered the storm and finished out the game comfortably. Fr. Tom's met a very good opponent in Wexford and will be hoping for a better outcome in their next game. The first half breeze heavily favoured Wexford, and the model county built up an early lead. After Ciaran Moore had opened the scoring with a point for Tom’s, Gearoid O’Connor put three quick points over the bar that was followed by Tom Moloney Shane Murphy points. Tom’s had chances to score, but failed to take advantage against the wind. Mid-way through the half a goal came for Wexford. A long free dropped into the square and the Tom’s backs failed to adequately deal with it, Shane Murphy got a stick to it to put it over the line. Shane Howley pointed twice from frees to keep Tom’s in shouting distance, however, Wexford managed to maintain the distance between the teams with points from Dominc Magill and Murphy. Tom’s got a lift with a goal from Ciaran Moore late in the half. Fran Keenan opted to go low with a close range free and Moore put the rebound into the back of the net. Tom’s picked up their effort and worked that bit harder to get to the loose balls and challenges, and it looked like we had a real contest on our hands. At the half Wexford held a five-point edge on the scoreboard. The Tom’s that started the second half was a different one than for most of the first. A heightened sense of urgency was evident in the play of the westerners. Ciaran Moore and Seamus Higgins reduced the deficit to a single score, however, Wexford restored their advantage thanks to two points from Shane Murphy. Shane Howley put two nice points over the bar, but Wexford would not budge. Tom Moloney and O’Connor, along with Dominic Magill buckled down to meet the renewed challenge, while Donal Redmond did great work at corner back for Wexford. O’Connor pointed twice to make it a seven point game with ten minutes to go, and the coup de grace was delivered by Eoghan Kavanagh who finished well from an acute angle to score Wexford’s second goal. Wexford setting the pace in the early season and have to be anticipating a cup final appearance in early June. Tom's: D. Fox, S. O’Brien, D. Nealon, E. Cummins, D. Moore, J. Dooley, F. Keenan, T. Kelly, S. Howley, S. Higgins, P. Heneghan, K. Mooney, C. Moore. Wexford: G. Grifffey, B. Dalton, D. Redmond, G. Dunphy, D. Magill, JJ Kenny, T. Moloney, J. Foley, G. O’Connor, P. Ryan, C. Kerins, S. Murphy, E. Kavanagh. Aidan McAnespies captured the first silverware of the season in style on Sunday afternoon. Despite conceding a goal immediately from the throw-in, McAnespies refused to get rattled. In fact, McAnespies rattled off eleven points in response and went on to win comfortably. The Tones managed to close the gap to three points early in the second half, but an adjustment in the back line and renewed focus saw McAnespies comfortably through to the final whistle. The Tones got off to the best possible start. Kenny Regan won the throw-in and sent Sean Kelly through for a goal within seconds. The goal did not rattle McAnespies, and the northerners answered in clinical fashion. McAnespies cancelled out the goal within minutes, and continued to run rampant through the Tones defence. Wolfe Tones options going forward were limited, McAnespies back line played tight and when in possession the Tones looked directionless . At the other end of the field, Plunkett Kane and Philip Toner were full of running and the forward line could not have asked for more in the way of support. Eleven unanswered points was the outcome. All five forwards got on the scoreboard and the Tones looked out of answers. The Tones showed some life towards the end of the half. Bart Blanchfield pointed, and Marty Farrell swung a trademark point over the bar from the sideline. Another two points from Farrell inched the Tones closer. At the half it was 1-4 for the Tones to an impressive 0-13 for McAnespies. as Philip Toner and Kenny Regan look on. The Tones opened the second half with serious intent. Within 5 minutes the deficit was reduced to three points. Blanchfield, Kelly, and Farrell combined to force McAnespies to make adjustments in the back line. It was game on again, and McAnespies were forced to make some defensive switches and pick up the pace to fend off the Tones challenge. McAnespies answered with some great scores. One from Plunkett Kane and another from Niall Kerr, each the finish to some great passing moves. With the difference between the sides six points and the Tones unable to make inroads, frustration got the better of Gary Brilly who was shown a red card for hitting Paddy McCusker off the ball. Kenny Regan was later shown a yellow for a dangerous trip. At that point the outcome was in little doubt. A great display from McAnespies who worked well together as a team. Plunkett Kane deserves the man of the match for a tremendous display. The Coalisland man worked hard and made intelligent use of the ball as well as taking some fine scores. Macs the ones to watch again this year. Macs: C. Kendrick, M. Bogue, A. McAnespie, S. Hughes, N. Kerr, N. Gallen, P. Toner, P. Kane, M. Little, C. McCrory, S. Magill, S. Cournane, P. O’Donohoe. Tones: C. Hynes, D. Maguire, A. Rooney, C. Malone, A. Higgins, M. O’Brien, G. Brilly, K. Regan, B. Blanchfield, C. Power, S. Kelly, S. O’Brien, M.Farrell. I spoke with Denis O'Brien last week about the Cup competitions. Check it out. The first silverware of the season is up for grabs on Sunday. Wolfe Tones and Aidan McAnespies will contest a final that holds a lot of promise. This will also be the first game for both teams on the main field, so the game might take a few minutes for the teams to settle. The Tones have had a couple of stiff challenges heading into the final. A hard fought win over Donegal followed by a victory over Connemara Gaels in last week's semi final have tested the Tones and should stand to them on Sunday. McAnespies on the other hand have essentially had a 2 week layoff following their victory over Christopher's in the first round, it will be important for them not to allow the Tones a fast start. Both teams have game changers in the squad. Marty Farrell for the Tones and Colm McCrory for McAnespies will be the ones for the other side to keep a tight rein on. A South Boston rivalry between teams full of quality players should provide an early season treat. The damage was done in the first half of the game and the Gaels had too much of a mountain to climb in the second period. Three clinical goals by the Wolfe Tones catapulted the team into the Pat O’Brien Cup Final next Sunday. In spite of losing wing forward Sean Kelly to a sending off, the Tones were able to hang on as a late rally from the Gaels ran out of time. scoring the Tones second goal. Sligoman Niall Judge and Marty Farrell traded points to get things started, and a lovely point from Gary Brilly was answered by Tom Walsh for the Gaels. Sitting at two points apiece, the Tones fired a salvo into the broadsides of the Gaels that put paid to the hopes of the westerners. Marty Farrell and Cormac Power matched superb moves with equally superb finishes to have the Gaels reeling. Farrell first finished excellently into the far top corner, and Power did likewise to in the other side of the net. The Gaels managed a point from Tom Walsh, but a third goal from Farrell left the Gaels staring at a 10 point deficit for the second half. The frustrating aspect from the Gaels standpoint was that the westerners enjoyed plenty of possession, however, much of the effort expended was not rewarded on the scoreboard. The Tones in contrast made effective use of the ball and the final pass usually meant a man in scoring position. The Gaels were thrown a lifeline early in the second half. Sean Kelly was shown two yellow cards for dissent. The Tones did not appear to be affected and extended their lead. Cormac Power fired two fine points over the bar, Shane O’Brien one, and Marty Farrell a fourth as the Gaels continued to make a huge effort for little reward. Stevie Monaghan, who entered as a sub pointed twice, and provided the Gaels forward line with some life. The Gaels Tom Walsh tries to round his man. ﻿ The Gaels continued to press and rallied late in the game. Had there been more time left on the clock, the outcome could have been different. With Monaghan making a mark in the full forward line the Gaels inched closer. Tom Walsh was pushed onto the edge of the square and eventually capitalized on a ball lobbed in his direction with a late goal. A Monaghan point reduced the deficit to four points, however, the final whistle put a stop to the comeback. A clinical win for the Tones who look impressive early in the season. The Gaels need a little more fine-tuning to get the machine working smoothly. Tones: C. Hynes, D. Maguire, A. Rooney, C. Malone, A. Higgins, M. O’Brien, G. Brilly, K. Regan, B. Blanchfield, C. Power, S. Kelly, D. Bonfil, M.Farrell. Gaels: B. O’Halloran, W. Callaghan, L. Wiley, V. O’Malley, M. Geoghegan, B. Murphy, G. O’Malley, T. McDonagh, J. Geoghegan, T. Walsh, N. Judge, B. Carroll, PJ Kelly. Wexford showed some great early season form in their first outing of the year. Wexford laid down a marker for the rest of the season with this game. Assisted by a stiff breeze the Boys of Wexford established a substantial early lead. Tipperary forwards in contrast were trying to survive on scraps and what few chances fell their way were sent adrift of the posts. Wexford had too many weapons in their arsenal for Tipp to deal with. Tom Maloney, Gearoid O’Connor, and Shane Murphy were in fine form. Gags O’Connor put the first point of the 2011 hurling season over the bar with a fine effort from play and traffic was mostly headed in one direction from then on. More points followed from Colm Kearns, Jason Foley, Peter Ryan, and free taking of Shane Murphy was spot on. Before the game was 10 minutes old Wexford held a 7-point lead. Tipp managed to generate some scores but the wind in their faces accuracy suffered. With the back line under pressure and the forwards unable to make much of what fell their way, a comeback seemed unlikely in the second half. At the break Wexford held a handsome 11 points to no score for Wexford. Peter Ryan and Cronan Dempsey Challenge for the ball. The wind did not do much to assist Tipp in the second half. Brian Howley got the Tipp men on the scoreboard with an early free, and briefly it looked as though a revival could be on the cards, but it was back to business as usual as the minutes ticked by. Tipp had chances to make the scoreboard look a little better, but opted for going for goal early on and the Wexford men manning the goal line were up to the challenge. Murphy pointed a pair for Wexford, and then the inevitable happened as Wexford hit the back of the net twice. Gearoid O’Connor was played through the Tipp defence, and made no mistake with just the keeper to beat. Tom Maloney netted the second and that was all she wrote. Impressive stuff from Wexford. Back to the drawing board for Tipp. Wexford: E. Spruhan, D. Redmond, B. Dalton, J. Kenny, D. Magill, G. Dunphy, J. Foley, T. Moloney, C. Kearns, P. Ryan, G. O’Connor, S. Murphy, E. Kavanagh. Tipp: M. Daly, K. Kindericks, J. Kindregan, J. Roache, B. Howley, A. McAnespie, J. Duane, C. Dempsey, A. McRedmond, D. Kealy, J. Howard, P. McGrath, J. McGrath.